The road from Lebanon's northern city of Tripoli into the village of Bibnine is lined with posters of young Lebanese men who died in fighting. Some of them crossed over the border to fight among the rebels in Syria, others died in the sectarian clashes in Lebanon itself, between the Sunni and Alawite communities - a tragic reminder of the spillover of the violence in Syria. Bibnine itself - only an hour's drive from the Syrian border - has become a safe haven for more than 1,000 Syrian families who have fled the fighting. Lebanon does not have organised camps like neighbouring Jordan: people who cross over stay wherever they can find shelter. Media captionAbu Abdo tells Shaimaa Khalil: "We had to flee our home. We came here with nothing"
Some families in Bibnine live in industrial storage buildings; one family has been using an old slaughterhouse for shelter. 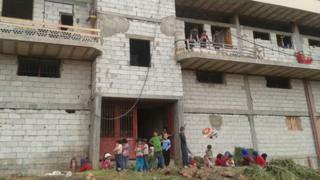 Abu Abdo's family found an unfinished building to stay in, having fled with many relatives. The bare building with the grey concrete bricks visible everywhere houses more than 20 families. "Don't bother counting," one woman told me as I tried to find out how many children were there. "There are so many of them." I counted 15 who gathered around us in one room. They were from toddler age up to early teens. "We have nothing here. We came with the clothes on our backs," Abu Abdo said as he showed me around. He is from the city of Qusair which saw heavy fighting a few months ago ending with a big loss for the rebels at the hands of government forces. "My sister-in-law died in the shelling; her three-year-old son was seriously injured. Many of our family members were injured," he said. "We had no choice: we had to leave to stay alive." Like many of the hundreds of thousands of Syrian refugees in Lebanon, Abu Abdo's family depends on food aid. But he says it is not enough. "I had a good life in Syria, my own shops, no financial worries. Now we can't even afford medicine if one of the children falls ill."
"I have to look for the odd job, or sometimes we have to sell the food we get in aid to secure the rent," he said. "Back in Qusair, I just had my new kitchen done, it was lovely; now look what we have, we don't even have functioning bathrooms," he tells me as he points to the concrete floor and the small corner that passes for their kitchen. As we walk out, many of the children gather around us. Abu Abdo's 11-year-old son, Muhammad, tells me that despite the constant shelling, he still misses Qusair. "I'm not happy here. It's not my country. Even though it's safer here, I want to go back, I want to have fun with my friends again."